Why use a TX Direct Spray On? If your raingear does NOT have a wicking lining use TX Direct Wash In. If it does have a wicking lining you are advised to use TX Direct Spray On. Your raingear could be soaking up water just because it is dirty. First, try cleaning it with Nikwax Tech Wash®, and if it is fairly new, or recently re-waterproofed, the Durable Water Repellency (DWR) will be revitalised just from cleaning. 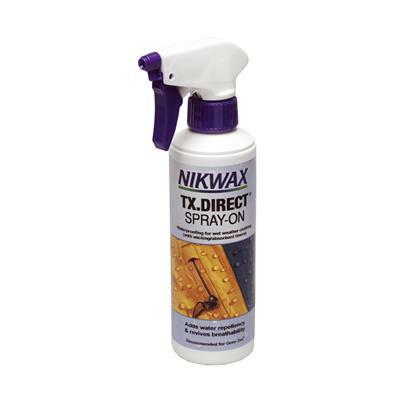 But, once the garment has been thoroughly worn, you will need to add DWR, using Nikwax TX.Direct®, after cleaning first with Nikwax Tech Wash®.Alternative waterproofing products are often solvent-based aerosols; alternatively, they may be water-based and use fluorocarbons. Aerosol products are flammable. Fluorocarbons pose a potential risk to the environment and to the long-term health of the consumer. • Protect working surface and lay clean wet fastened garment flat. • Hold bottle 15 cm/6 inches away from garment. • Apply evenly to outside of fabric. • Wait for 2 minutes. Remove any surplus product with a damp cloth. • Check carefully to ensure no areas have been missed. • After several minutes check for and remove any surplus product with a damp cloth.